This book, ten years in the making, is the first factual and conceptual history of Martin Heidegger's Being and Time (1927), a key twentieth-century text whose background until now has been conspicuously absent. Through painstaking investigation of European archives and private correspondence, Theodore Kisiel provides an unbroken account of the philosopher's early development and progress toward his masterwork. Beginning with Heidegger's 1915 dissertation, Kisiel explores the philosopher's religious conversion during the bleak war years, the hermeneutic breakthrough in the war-emergency semester of 1919, the evolution of attitudes toward his phenomenological mentor, Edmund Husserl, and the shifting orientations of the three drafts of Being and Time. Discussing Heidegger's little-known reading of Aristotle, as well as his last-minute turn to Kant and to existentialist terminology, Kisiel offers a wealth of narrative detail and documentary evidence that will be an invaluable factual resource for years to come. 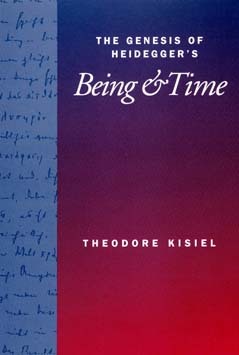 A major event for philosophers and Heidegger specialists, the publication of Kisiel's book allows us to jettison the stale view of Being and Time as a great book "frozen in time" and instead to appreciate the erratic starts, finite high points, and tentative conclusions of what remains a challenging philosophical "path." Theodore Kisiel is Professor of Philosophy at Northern Illinois University and translator of Martin Heidegger's History of the Concept of Time.